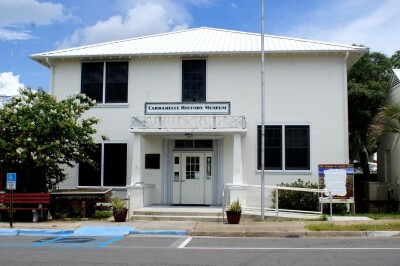 The Carrabelle History Museum opened in April of 2009. Residents of the town have generously shared their pictures, genealogy, memories, household and work items to build our collection. 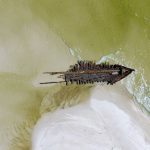 We have several special displays that highlight Local Heroes; the Steamship Tarpon, which was key to building our community in the early 1900’s; and Carrabelle’s “First People”, natives who lived here thousands of years ago. The Mission of the Carrabelle History Museum is to preserve the history and culture of Carrabelle as a record of where we have been, how we got here and to serve as an inspiration for the future. Visit the Carrabelle History Museum at 106 Avenue B, SE, in the heart of downtown. The Museum is one block south of US98. Turn south on Marine Street and left (east) at the first corner. The Museum is the third building on your left. We are within walking distance to the Carrabelle Visitors Center and the World’s Smallest Police Station. The Carrabelle History Museum is open Wednesday 12-5 pm, Thursday 10 am-5 pm, Friday 10 am-5 pm, Saturday 10 am-5 pm, and Sunday 12-5 pm. We gladly open any other day by appointment except Thanksgiving, Christmas and New Years. Just call 850-697-2141 or 850-524-1153 to arrange a tour. Field trips and buses are welcome. Entry to our Museum is free but donations are always welcome. 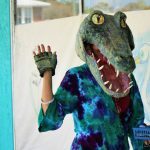 The Carrabelle History Museum is a project of the local non-profit organization, Carrabelle CARES. It started as an idea of the Carrabelle Waterfront Partnership found in their document, “Charting the Course for the Carrabelle Waterfront: A Vision Plan”. 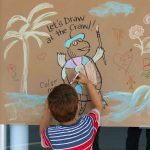 It is sponsored by the Carrabelle History Society and the City of Carrabelle with support from the Franklin County Tourist Development Council with a community partnership from the Franklin County Public Library. It opened in April of 2009. 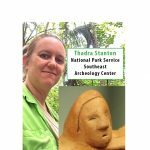 It is staffed by volunteers and funded through donations, memberships and grants. 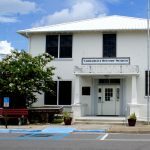 The museum is located in the Old Carrabelle City Hall built in 1933 as project of the Works Progress Administration (WPA) by local mason Marvin Justiss. An anchor historical building in the heart of our historical downtown. The museum has 4 rooms to display its collections, a workroom/office for the volunteers to process the incoming artifacts and a nice long hallway for special seasonal displays. The building is the Old Carrabelle City Hall, the Marvin N. Justiss Building. The City conducted its business here for 75 years. It was named in honor of the local brick mason who created each block and brick with hand-crafted local materials. It was built in 1933 as project of the Works Progress Administration (WPA). The structure is a two story brick venacular style of that period. Mr. Justiss is often called the “Father of Carrabelle” since he built over 119 businesses and homes throughout the 1930’s when the town was rebuilt at its current location after being ravaged by storms and fires. We are gradually rehabilitating the building with the help of the City and the Florida Department of State, Division of Historical Resources.